Flipped Classrooms – Are flipped classrooms just a trend or are they useful and lasting? Are flipped classrooms just a trend or are they useful and lasting? At the end of the day, I have fallen in love with the idea of a Genius Hour. Through this project, I have gotten to explore a facet of education that I’m really interested in. Just three weeks ago, the idea of a flipped classroom was completely foreign to me. Now I’m so excited to see how they take place in the future. Though I likely won’t make any more blog posts or tweets about flipped classrooms, I will definitely keep up with the news about them. I am genuinely curious. One of the biggest things I learned through this project is value of good resources. Twitter has probably been my favorite. From twitter chats to simply searching hashtags, I have learned so much from so many different professionals. I’ve also learned the value of blogs, testimonials, and professional articles. Many of the things we read about for our other tasks helped to shed light on my flipped classroom project. Although I learned vast amounts about the education field in general, I learned the most specifically about flipped classrooms. My question that began this project was: are flipped classrooms a trend or are they here to stay? I can wholeheartedly say that… I don’t know. There simply isn’t enough research to say definitively what will happen. However, I can also wholeheartedly say that I hope they do stick around. I want my children to experience that type of classroom. I want all children to experience a classroom where they feel comfortable being confused and confident enough to speak up for themselves. I really believe a flipped classroom has so much to offer students. 1. I like the idea of presenting my project in a newsletter. If it was typed out, it would be easy to do pros and cons, testimonials, and short pieces of research. It would also be a great way to give links and places for readers to continue research on their own. Because there is very little scientific research on flipped classrooms, I’ve found that it’s important for each individual looking into it to form their own opinions. I feel like a newsletter is a great way for me to promote that in my readers. 2. I also really like the idea of a video. Doing flipgrid videos this semester has been fun, and I find that’s the easiest way for me to communicate what I’m learning with the class. If I did a video, it would be fun to set my own mini flipped classroom and walk the viewer through a day of learning. I think this would be a really fun presentation to do and to watch! 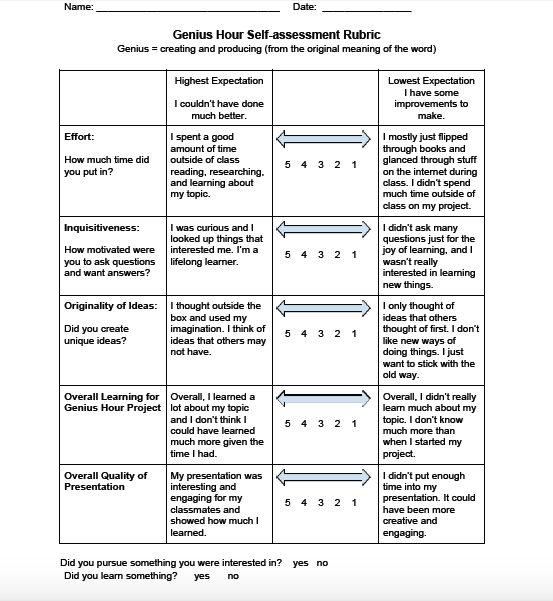 Below is a great rubric for how I want my project to be graded. The thing I’ve learned the most from this genius hour project is that I should have learned something (funny, right?). Although there are a lot of components to my project, it really is as simple as that. Earlier this week, I found a great article relating to my project! Written by Frank Smith, 10 Reasons Flipped Classrooms Could Change Education, is an excellent list of reasons why students can benefit from flipped room. Again, I found this article on twitter as I was searching different flipped classroom hashtags. As I read through the list, a lot my previous questions were answered. The second point Smith makes, flipped learning individualizes learning, really excites me. This is what I was talking to my brother about. If students can enter the classroom with foundation for a new topic already in place, they will be ready to learn how they know best. If they want to work in a small group, and the teacher allows it, then that’s great. If the student wants to take a few minutes to work something out themselves before asking for help, then that’s great too. If this idea really works, it is in my opinion the ultimate k12 classroom. His fourth point on the list is that flipped classrooms improve effectiveness. The little research that’s out there on flipped classrooms suggests that students students are learning and behaving better. While this isn’t a set in stone piece of data, it gives me hope. One thing I worry about flipped classrooms is that it’s a great idea – and that’s it. It’s a difficult concept to implement in a classroom, and if a teacher is not dedicated to it, it will no doubt be a failure. This list goes on and is definitely worth the read. It has given me a lot of hope that flipped classrooms will be something my children experience, and I can’t wait! This week, I decided to interview my oldest brother, Robbie, about his thoughts on flipped classrooms. He is finishing up his undergrad education degree at the University of West Georgia. Of all the educators in my family, I chose him because I knew he had probably studied the concept. I also thought he might have experienced teaching in a flipped classroom while he has been student teaching. As it turns out, he likes the idea of flipped classrooms for gifted students. In his opinion, advanced students will be happy to take the initiative to watch lectures at home, and they will find class time working on problems a lot more interesting and engaging. His concern with the flipped classroom is that students who struggle with learning will not be motivated to watch lectures at home unless their parents are 100% there to support them. A lot of students, especially younger ones, who struggle a lot in school generally won’t be motivated to learn outside the classroom and take that responsibility upon themselves. On the other hand, if you have a classroom with advanced students who are willing to watch lectures at home, Robbie believes the class time will be extremely beneficial to these students. He believes class time can be used to work out problems individually if need be, but he is most excited about students collaborating and working in groups during class. He says many of his college classes were designed like this, and he personally benefited greatly from them. His idea is to take that concept and tailor it to an advanced k12 classroom, and he believes students would excel! I agree with my brother’s opinions, however I would like to further explore how students who struggle could benefit from the flipped classroom. I think it’s pretty common sense that gifted students would enjoy a flipped classroom, but I’m not quite ready to say that’s the only demographic that can. Upon looking further into my research question: are flipped classrooms a trend or here to stay, I found many sites, advice columns, articles, and blogs from many different resources. Though I found a vast amount of information, I have narrowed it down to three really great sites (I’ll post the links at the bottom – make sure you check them out). First, based on a suggestion from my twitter chat, I found ISTE.org writer and educator Jonathan Bergmann’s article explaining how a flipped classroom might be a better approach to teaching the new common core standards. He explains that the common core was set up to make students think deeper about many unique situations instead of teaching a broad set of facts and figures for them to simply memorize. However, most teachers are prepared for teaching the common core only by learning what the standards are – not how to teach them. Bergmann suggests the flipped classroom approach, saying this model allows teachers to dive deeper into questions with their students. What I like most about this article is it doesn’t just give you one answer or opinion. He opens the floor up for discussion, and if you have an ISTE account, you can and should participate in this discussion. I believe he is on to something. If students are supposed to gain deeper thinking and analytical skills, the teacher should be right there to help them along! By coincidence, I stumbled upon Bergmann’s blog. He implements the flipped classroom model himself and keeps track of it. Once I found this, I knew I couldn’t pass it up. In his latest post, he explains that he visited a classroom where the teacher implements the most basic form of a flipped classroom: short video at night and typical homework assignments in class. He notes that the students were ready to work on their tasks as soon as she assigned them. This makes me think that just having time for the information (even from a short, three minute video) to soak into the students’ minds overnight allows them to be more prepared the tasks at hand. I know personally I learn better when I review something once and then come back to it again a short time later. That’s how I learn processes and the logical side of things (and believe me, accounting is very logical but I usually miss it at first because I’m too busy memorizing notes). Bergmann also says that each student watched the video and one student even watched it twice because he didn’t understand. This shows me that the students are actually trying to learn. Most of them aren’t just watching the video just to be done with their homework – they are watching it so they can be prepared to actually learn the topic in class the next day. Lastly, I was given another teacher’s website on twitter (funny how that works). This site has a whole host of information on flipped classrooms for educators, students, and parents! And all of the information comes straight from a teacher using the flipped model. I love the resources this site provides because it’s great for all kinds of research on the topic! The one thing I’ve overlooked throughout my research is parents and their roles in the flipped classroom model. Just as the teacher’s role slightly changes, so does the parent’s. With a flipped classroom, parents can watch the video with their children and know exactly what is being taught in school. Also, they help more with teaching the student at home. Many times, a student will learn one way of doing things at school, ask for help with homework from their parents and learn a completely different method at home. This often leads to confusion for the student and tension between parents and teachers. With the flipped model, teachers are more available to parents, and parents feel like their more involved in their child’s education. This week, I found that many of my classmates are also interested in finding out if students are getting a truly meaningful and abundant education. I think it is awesome that all of us are taking such an interest in how effectively students are learning. As someone who is not majoring in education, it’s awesome to see my classmates (some of who are also not education majors) take a true interest in education. Because I went to high school where my dad worked, I was there from the time the building was unlocked til the time it was locked back up. I got to see every facet of an educator’s life for four years, and it has given me a true appreciation for the hard work and dedication of said educators. Though it is not my plan to pursue a career in education, I most definitely have an interest in it, and love to see the support from classmates. On Monday, May 18, I participated in my first ever twitter chat using the hashtag #flipclass! I highly recommend this hashtag to anyone who might be interested in researching this topic further, especially on Monday nights. The two users who moderate the chat, @thomasson_engl and @guster4lovers, are incredible educators who ask really thought-provoking questions. And each person who answers is just as remarkable. Tonight, we briefly discussed how students can do research assignments in a flipped classroom. Many opinions flew around, and I found a great wealth of knowledge! Because students can perform research on almost any subject, whether it is a flash search or a formal research paper, I feel like that is a great direction to take my own project. It’s something specific I can focus one without leaving any particular school subject out. Also, a few users tweeted different links to websites, which I am so thankful for. Knowing these sites are recommended by teachers who use the flipped classroom model themselves reassures me that I am on the right track with my own research. All in all, I’m happy to have found a community of people online who helped me narrow my focus with this project while also providing me with the confidence to move forward! Although I am not an education major, I come from a long family line of teachers. Everyone, and I mean everyone, in my family (grandmothers, aunts, and uncles included) are educators. For that very reason, I have always kept up to date on the latest classroom trends and newest teaching styles. I chose to dive into the idea of the flipped classroom because I feel that, had the idea been implemented, it would have greatly impacted my grade school experience, as well as my college classroom experience. At the most basic level, a flipped classroom is where a teacher provides some sort of video/electronic lecture as homework and during actual class time students practice and work on problems – i.e. what is traditionally thought of as homework. I got a small taste of this practice my sophomore year at UGA when terrible snow storms caused a week of classes to be cancelled. My accounting professor knew she wouldn’t have enough time to catch up on all the lectures we had missed, so she recorded the general lecture, emailed it to us to watch at home, and proceeded to go through a few examples with us when we returned to class. Traditionally in accounting classes at UGA, the entire class time is spent on conceptual lecture and it is up to the student to work problems themselves at home. Getting to spend actual class time working on problems with my professor was a big deal, and a year later I still remember what I learned in those precious moments of class time. If this one time had such a big impact on my college career, I am positive the idea of a flipped classroom can and will greatly impact all levels of learning, especially K12 learning. Although it seems like everyone should be hopping on this awesome “bandwagon”, implementing a flipped classroom is difficult. First, it can be costly. The idea is that learners will watch and/or listen to their teacher’s lecture at home on some sort of electronic device. Not all students have access to computers, tablets, etc. at home, so many school systems feel they are obligated to provide these to students. While many systems are already on board with providing children with netbooks and tablets for their time in grade school, for some school systems it just simply is not feasible. The funding is not available. This fault tends to lead to another. Though many teachers are ready to tackle a flipped classroom model, it can sometimes be difficult to sell the idea to administration. Administrators typically care just as much for their students’ education as teachers do (I promise they really do! ), but they also have to balance these great ideas with the practicality of implementing them. In order to look further into this topic, I hope to research the schools and classrooms that have already implemented this model. In some cases, entire school systems have switched to a flipped classroom. In other cases, there may just be one teacher in an entire county/city using this model. I want to see if there is enough of a support system for a teacher who may be “alone”, and if they feel it is something they will continue for many years. Also, time permitting, I would love to sit down with one or two of the many educators in my family and get there opinions on it. Being able to actually speak to someone who may have had the idea thrown at them would be an invaluable resource. Ultimately, I hope to answer the question: is the flipped classroom model a way for students to get a valuable, meaningful education and will it turn into a lasting teaching style, something perhaps my children and grandchildren will experience, or is just a trend that will be forgotten this time in a couple years? For anyone interested in this topic, I highly suggest you follow @flippedclassrm, @flippedlearning, and @ChrisWaterworth. I also like to search the hashtags #flippedlearning, #flippedclassrooms, and #blendedlearning. Both the users and hashtags pull in research and ideas from all around the world making it fascinating to see what people are doing to integrate this model into classrooms everywhere.